DISCOVERS THE TRUE NATURAL RESOURCE OF LOUISIANA: ITS PEOPLE! New Orleans (February 2013)—WLAE-TV New Orleans will premiere the “Coastal Character” episode of the Emmy Award-winning program Go Coast: Louisiana, Sunday, February 23RD at 8:30PM. The episode will also run statewide that same day at 6:00PM on Louisiana Public Broadcasting. Louisiana is best known for its cuisine, culture and craziness; but it is the people who call this coast home—and work every day to make it a better place—that make coastal Louisiana a place like no other. In this video essay of his trip along the state’s coast, Go Coast’s host Tom Gregory visits with Grammy-nominated bluesman and indefatigable conservation advocate Tab Benoit, where they will go down the bayou for a look at the vanishing coast and then backstage at the Voice Of The Wetlands Concert for a varied taste of the state’s musical legacy. Louisiana Public Broadcasting will also premiere statewide the Terrebonne episode Sunday at 5:30PM, where Tom discovers it’s easy to pass a good time with the good people of this area named “the good earth”. During his journey through Louisiana’s Bayou Country, Tom calls alligators with Captain Ron “Black” Guidry of A Cajun Man’s Swamp Tour. At the Jolly Inn in Houma, he ventures onto the dance floor and experiences some true Cajun hospitality. There is also a stop at one Houma’s newest hot spots, Vino! On his visit to the Regional Military Museum in Houma for a history lesson on World War II, the host grabs the wheel of both a M-113 Armored Personnel Carrier and a LCVP Boat. At Southdown Plantation, Tom takes the seat of power—if only for a minute—at the desk of Senator Allen J. Ellender. His tour also includes the Bayou Terrebonne Waterlife Museum and the Chauvin Sculpture Garden, that is the home of hauntingly emotive art of Kenny Hill, who disappeared in 2000. Also in this episode, the host goes 30 miles off shore to do some deepwater fishing with Captain Lee Schouest of CoCo Marina. The results may change fishing forever. 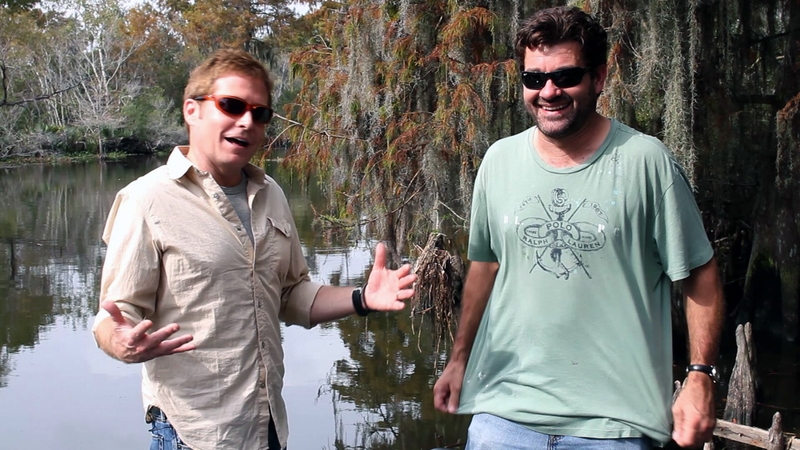 The episode is a perfect travel guide for your own adventures through Louisiana’s Bayou Country. Louisiana Public Broadcasting (LPB) airs statewide in Baton Rouge (WLPB), Alexandria (KLPA), Lafayette (KLPB), Lake Charles (KLTL), Shreveport (KLTS) and in Monroe (KLTM). In the show’s first season, Go Coast: Louisiana, produced by WLAE-TV/LAE Productions, has won two Emmy Awards (Tom Gregory has won the award in the On-Camera Talent category for two years in a row!) and has been honored with two Excellence In Journalism Awards from the Press Club of New Orleans, the most of any non-news series in Louisiana.